By some estimates, there are 43.5 million unpaid or informal caregivers who are providing caregiver support to aging family members, including those with physical disabilities and those with limited cognitive abilities who can no longer care for themselves. Statistics show that caregivers who provide care for 21 hours a week or more are most likely to be caring for a spouse or a partner. These “high burden” caregivers tend to suffer from chronic back, shoulder, knee or wrist pain resulting from the physically demanding work. An Ohio State University study showed many caregivers reported experiencing musculoskeletal pain that negatively impacted their own quality of life and resulted in a reduced ability to provide care for their loved ones. Caregivers reported that transfers, bathing, stair navigation and fall recovery were the most burdensome and difficult tasks to perform. While men are sharing in caregiving tasks more often than they have in the past, women are largely shouldering the responsibility of care. Family caregivers provide help with daily and instrumental activities, including help with personal hygiene, getting in and out of bed or a chair, assisting with transportation or shopping, meal preparation, housework, financial planning, medication monitoring and more. Frequent transfers and lifting can be hazardous for people on the frontlines of patient care, as obesity and chronic diseases can make manual handling and transfers even more precarious. Those who provide training tips for high intensity and physically demanding care know that safe patient handling as well as the safety of the caregivers is of the utmost importance. Helpful suggestions for home caregivers include getting informed about available community resources or caregiver classes, asking for help when needed, seeking out respite programs and support groups, and taking the time for essential self-care. Local agencies can often connect caregivers to services that provide emotional support, respite care for caregivers themselves, and other supportive resources for caregivers. As caregivers often feel guilty when they can’t do it all, speaking with a counselor or social service worker can help caregivers feel good about what they can and do provide. Patient handling continues to exact a toll on professional caregivers and homecare providers alike. Healthcare workers who receive training to reduce the risk of injury still reported similar difficulties and injuries. All care providers should know that a regular stretching can help to alleviate and prevent muscle tightness. Muscle strengthening exercises and the proper gear as well as proper lifting techniques and lifting aids can help to prevent a possible joint injury and pulled or strained muscles, ligaments or tendons. Specific factors that can influence injury risk for the patient include weight, size, cognitive functioning, physical impairments and cooperation. Handling risks for the caregiver include balance, coordination, lower limb function, physical limitations and improper technique. 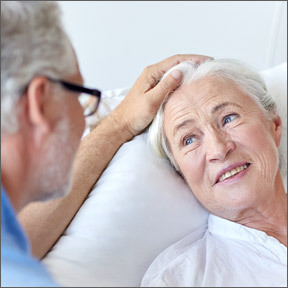 Additionally, the patient’s position relative to the caregiver, frequency and duration of lifts and patient stability all are influential when handling patients. Easy Lift Positioning Blanket by Blue Heron Medical Supply: Designed for patient and caregiver safety, as well as reduced strain, injury and fatigue, the Easy Lift Blanket provides stability for better control during movement, and makes lifting less strenuous for caregivers and more comfortable for patients. Eight easy grip handles allow for a carrying load of up to 600 pounds. Manufactured with hypoallergenic, durable, and waterproof machine washable fabric. Serola Sacroiliac Belt by Serola Biomechanics: This belt provides stability to the base of the spine, providing the correct balance of resistance and resilience, and reducing risk of injury. For maximum safety, support and pain avoidance, the belt should be worn when bending, lifting or twisting. Available in sizes S, M, L and XL. Compression Elbow Sleeve by Zensah: Targeted compression technology provides support and pain relief while allowing a full range of motion. Manufactured with moisture wicking, anti-odor fabric, the lightweight sleeve stays in place, providing additional compression when relief is needed. Available in sizes S, M and L.
This entry was posted in Home and tagged Caregiver Support, Compression Elbow Sleeve by Zensah, Easy Lift Positioning Blanket by Blue Heron Medical Supply, Informal Caregivers at Risk for Chronic Pain, Serola Sacroiliac Belt by Serola Biomechanics. Bookmark the permalink.